I love it when a game comes along and surprises me. If you just looked at the app icon, you would think this just another Minecraft clone but with a car theme, but nothing could be further from the truth. 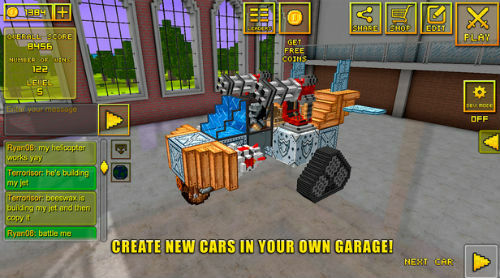 Blocky Cars Online is a mix of the vehicle building element from Banjo-Kazooie: Nuts and Bolts and the road warrior element from games like Twisted Metal and Vigilante 8, all with a remote-controlled Lego car look, and in practice is almost as good as it sounds. You can build your dream car in a pretty comprehensive 3D builder, putting the pieces in the correct places, and adding things like guns and even rotors and wings (yes you can fly in this game), all from a pool of around 40 different objects. It is here where you will be spending most of your time, tinkering away in between battles and races, perfecting your vehicle. It is here that I must share a criticism. You have to spend in-game currency to repair your vehicles, after every race or battle. I really feel the developer should change this, or at least allow a certain amount of free repairs per day, as it does feel a bit much to be charged for repairs. – 40 types of building blocks! – Realistic physics – machines break down, smash, explode! – Unique physics – each you receive a unique situation! – Up to 8 players on the same map in a multiplayer mode! – Chat with your friends all over the world! 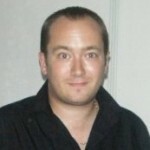 – Continuous support and updates! – Race mode and Death mode! There is the option to chat in an open lobby, even when in the building screen, which is a great way to open up the community. There really should be a better automatic filter for swear words, however. The battles themselves are great, and it feels fantastic to go to war in something that you created from scratch, especially when you see it outperform vehicles others have created. It just makes the battles a bit more personal, and winning is that little bit more special because of the personal investment you have made into your creation. Races don’t work quite so well, as it is easier to get certain combinations of objects to give you an advantage, but they are still a good distraction and I am glad they were included. The game moves pretty smoothly, especially considering all the custom elements, and there can be quite a lot for the engine to keep up with when you have eight players all playing online. Overall, this is a great little customisable race/battle game that has an almost endless supply of gameplay and battles. With creativity at its heart, Block Cars is a very decent game.